Emphasizes the connection between delineated care plans and proven outcomes. Montefiore’s established systems of collective decision making foster excellence, shared governance and accountability—all of which contribute to achieving quality patient outcomes, in addition to advancing the entire discipline. 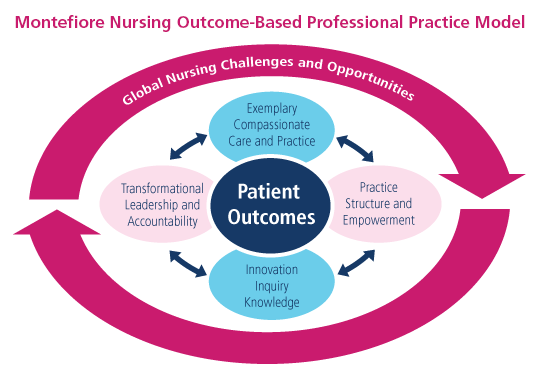 Nursing councils that establish a methodology to propel and guide decisions in the areas of professional practice, education, documentation, policy, research, resource allocation, recruitment and retention, strategic planning and future directions. A system of shared governance that creates checks and balances to continuously evaluate the effectiveness of care processes and patient outcomes. A new initiative at Montefiore, called Nursing Scholars at the Bedside, emphasizes minute-to-minute critical thinking skills by linking empirical data to care plans. The program uses state-of-the-art technology, tools, education and faculty resources to help nurses hone their evidence-based practice and build their confidence. As part of the initiative, nursing staff participate in a course entitled Evidence-Based Practice at the Bedside, which is now required as part of the clinical core orientation. Every week, facilitators round on assigned units, where they conduct one-on-one training sessions with the staff—invaluable teaching opportunities. In each of these, the facilitator discusses the care and treatment strategy for a specific patient and guides the nurse through an on-the-spot literature search to determine best practices and formulate a plan of action. The structural empowerment that Montefiore provides measures and improves quality of care and illustrates the positive impact that nurses have on patients. This approach furthers our nurses’ individual progress as well as that of the profession as a whole.